Habitat: Desert, Upland. 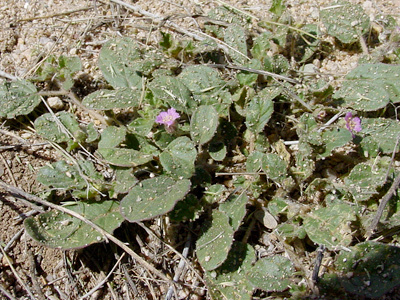 This wildflower grows in dry, sunny, open areas. Description: Each small, ruffled, funnel-shaped flower is actually a cluster of 3 bilaterally symmetric flowers. The flowers are followed by fruit with a shallowly convex stem end and 4 to 8 teeth on each lateral rib. The leaves are green, in pairs of unequal size, progressively smaller and narrower toward the stem tips, egg-shaped, wavy-edged, sticky-haired to almost hairless, and petioled with a petiole that's equal in length or shorter than the blade. The stems are plump, trailing, sticky-haired to almost hairless, and usually reddish in color. 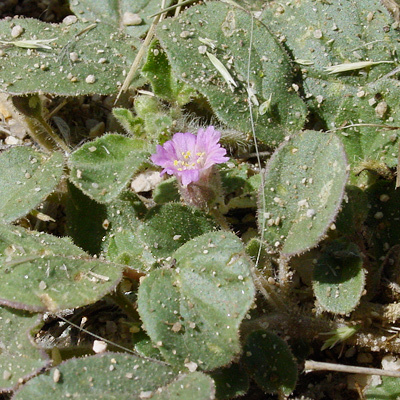 The plants with sticky, glandular hairs are often covered with dirt and plant debris. The similar and much more common Trailing Windmills (Allionia incarnata) has much larger, often more intensely colored flowers and fruit with a deeply convex stem end and 0 to 4 teeth on each lateral rib.